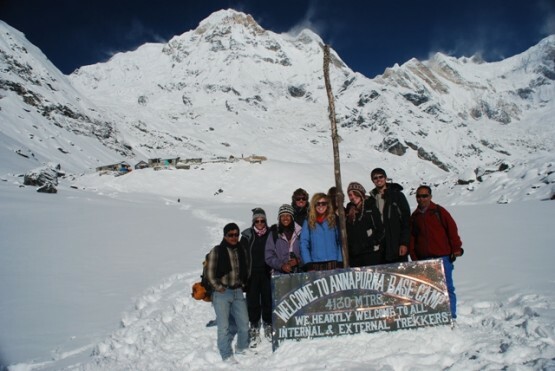 Take an Annapurna Base Camp trek with Oyster! Easy as ABC – trek to Annapurna Base Camp with Oyster! We are delighted to launch our new trekking website, which offers 4 exciting treks to anyone looking to fill their annual leave with awe-inspiring adventure. Everest Base Camp, Annapurna Base Camp, Ghale Gaun and the Langtang all have their own unique charm and are manageable for anyone with reasonable fitness and hill walking experience – unbeatable if you love the great outdoors and fancy a real challenge! Oyster have been organising reputable treks for volunteers in Nepal since 2003 and fully understand local culture and how to give you the best of Nepal in just a short amount of time. We have a very friendly and highly experienced rep, Basant, who has worked for us from the very beginning. He will meet you at the airport, introduce you to our fantastic guides and porters and get you settled into Nepali life in the heart of Kathmandu. All our trekking staff are fully trained and equipped for your health and safety throughout your stay. We also throw in guided sightseeing of Kathmandu and trek locations (in the case of Annapurna this is the stunning lake town of Pokhara) before you start walking! Trek the Annapurna sanctuary with Oyster to take in the most stunning scenery that Nepal has to offer. One unique aspect of this particular trek is the dramatically changing landscape as you climb – no one day is the same, with snow at the peaks and sunbathing weather at the foothills! You will also experience real Nepal, visiting remote villages and meeting trekkers from all over the world. You will also have a full day at ABC to take in your amazing surroundings (don’t forget your camera!) and even meet those attempting the summits of Annapurna 1 and Annapurna South, which reach over 8000m! Base came itself is over 4000m above sea level – certainly something to write home about! The cost of the full 16 day experience is £930 per person, excluding flights (which we can arrange for you if you prefer). This includes a 10 day trek to Annapurna Base Camp and your national park fee, knowledgeable and well-regarded guides and porters. We also supply you with a good quality Oyster trekking kit bag for all your essentials – though be kind to the porters and keep the weight below 15kg please! We include sightseeing in bustling Kathmandu and beautiful Pokhara, with all transport and comfortable lodge and hotel accommodation included throughout. You will need a maximum of £13 per day for food, which is plentiful and delicious and very reasonably priced! You really will have the time of your life on this trek, taking in not only stunning scenery but also the colourful culture of Nepal and the friendliness of her people. So, why wait? Book today and take advantage of this fantastic opportunity! 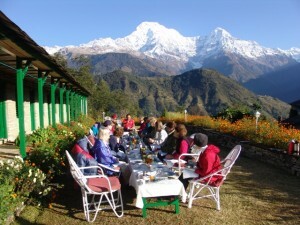 For all details about Annapurna and other treks visit our trekking website or email Jon at [email protected].